Nokia's competitor for iPad Mini and Nexus 7 is expected to arrive at the end of September. The rumors about Nokia's Windows powered tablet have been out since 2011, but they all proved to be wrong. The same year, Nokia received patents for 2 tablet designs, so it became obvious that the Windows tablet is more than just a rumor. Now, it only remains to be seen what is going to be released and when. A Nokia event will take place in New York City, at the end of September. 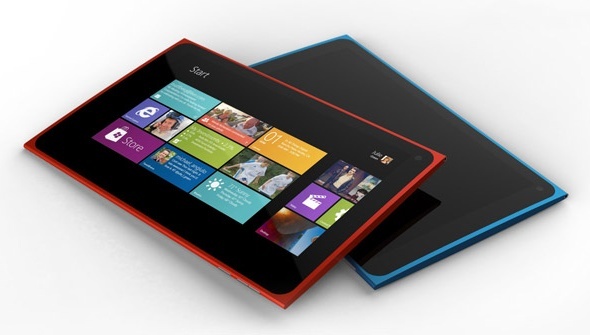 The Nokia Windows tablet will be released with Windows 8.1 preinstalled, but Windows RT could also be used. The size of the tablet will be 11 inches and its design will be inspired by Lumia, featuring bright colors and rounded corners. The benchmark results for a device called Nokia RX-114 got published on GFXBench. According to this page, the tablet features a Qualcomm Snapdragon 800 CPU and has a resolution of 1371X771 pixels. A 5-inch or larger phone is also expected in October/November, maybe even a two SIM competitor to the upcoming Samsung Galaxy Note 3. On the other hand, two SIM Lumia phones could be released separately. With Apple also close to releasing new iPhones, it seems this fall is going to be very interesting. We'll keep you posted as new information arises.